It’s no secret that choosing the right thank you gift for a family member can be challenging. Your dad is the man who has everything, your mom is the woman who wants for nothing and every sibling has different interests, hobbies and preferences that range from exploring the world to caring for orphan animals. Don’t surrender to the challenge by picking up a gift card; instead, choose or make a personal gift. You’ll impress even the most critical family member with these unique gifts. These family-centered thank you gifts focus on affordability, creativity and heritage. Celebrate the Scottish clan, inspire the Italian chef and make game night into an enjoyable evening while you share a meal with the ones you love. These inspired gifts will remind you to celebrate family. Whether you’re seeking out thank you gifts for families who host engagement parties, baby showers, holiday or birthday parties, these family presents are ones they’ll all adore! The entire family will love their own bean bag chairs as they enjoy movie or game nights! It’s the most comfortable way to kick back and relax. Customize your own cards with this matching card game that is ideal for toddlers. Add your favorite photos to make the game even more fun and associate learning with family. Whether they’re used as sketchbooks, travel journals or family reminders, these personalized notebooks will be appreciated by every family member. Make your own custom pot holder for the family chef. 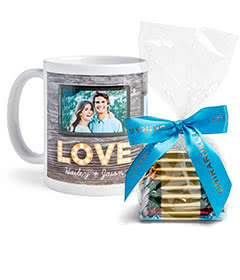 These can be mixed and matched or customized with your favorite photos. Treat your favorite globetrotters to personalized luggage tags. Each tag has the person’s name and information engraved on it to make for an easy way to track luggage that disappears en route. Complete your bar with customized Pilsner glasses for those light beers. Emblazoned with the family crest, they are the perfect family gift. Make your lakefront vacation one to remember with a custom puzzle. You’ll want to remember every moment, and this jigsaw puzzle makes it possible. Make memories from family vacation by using this sea glass tutorial to turn any storage jar into a gift. Choose from sea glass collected on vacation or purchase it from your local craft store. This is a beautiful way to show love to a family member and it’s the perfect fit for any type of decor! Create some personality for that wall of shelves or row of books. These custom plaques are perfect for adding your favorite saying or the owner of all of those shelves. A collegiate scarf is the perfect gift to send with college students as they head off to school. Not only is it a meaningful gift, it provides an important function by protecting students from the cold. Cuddle up with a teddy bear— it’s the perfect way to show your love to a family member. Remind your kids that you care about them even while they’re at school. These custom treat bags can be easily prepared weeks in advance and each features a customized message to remind kids you’re there for them — even when they’re away from home. These rose gold circle charms give a classy touch to any favorite photo memory. Ideal for any family member who has lost someone special. Show off the items that mean the most to you and your family with these shadow boxes. Ideal for displaying memorabilia in any home. For the family that has everything, a catch all tray is the perfect gift. Use for keys, receipts, mail and more. Gifts in a jar are creative, fun gifts that the whole family will love. The spa in a jar is particularly popular among all family members. Be creative in selecting products and learn to make your own bath products for a personal touch. Every pet deserves a bowl of their own! Choose from a large collection of pet bowls in a variety of sizes to personalize your pet’s food bowl. There’s not a dog in the world that can’t use a custom bandana! Choose from a wide selection of colors and styles — it’s the perfect gift for your four-legged family member. These adjustable aprons are the perfect way of saying thank you for a long history of incredible meals. Each is easily customized and brings some style to the kitchen. Chocolate and orange peels may not sound delicious, but rest assured it is! Every member of your family will be scrambling over these delicious treats. Make them a sweet they’re sure to love! Personalized toiletry bags are ideal gifts for kids headed out for their first sleepover, a family trip or even for emergency preparedness. Choose your kids’ favorite style and personalize with their name. Relax with your favorite lager! This is the ultimate gift for a family member who values a frosty beer in their man cave or she shed. Wrap yourself in your favorite family memory with this woven photo blanket. It’s the perfect gift for kids heading off to college. These custom box gifts are completely personalized and a fun way to remind any family member that you know them better than anyone. Choose a collection of items to include, then select a unique theme to bring them all together. Make a spa box, birthday box, a “congrats on your new car” box, speciality pet box or one that fits their personality perfectly. Garden stones are the ideal way to personalize an outdoor patio or garden. Memorialize a family pet or use as markers for favorite herbs. There are a million uses for these laser-etched stones. If you have a child who needs a little extra courage, a cape can make them feel like a superhero. Perfect “get well” gift for kids who are feeling under the weather. You’ll know what day it is at a simple glance with this gallery calendar mouse pad. Customize with your favorite photos and always have a calendar available. Repurpose a pair of pants and reassure your dogs they are number one in your life! Create a dog jacket that will not only keep your dog warm, but remind them of you all day long. This is a great way to repurpose old clothing! Whether you prefer an ice-cold soda or a beer with a twist, can coolers are the best way to keep beverages cold. Create your own custom can coolers for each family member — it’s an easy way to keep track of drinks at family parties! Did you procrastinate getting a gift this year? Don’t worry — we have you covered. This magnetic alphabet board is ideal for anyone with grade school children (or consider shaking things up by creating an adult board with words from great works of literature). Customize these beautiful vases with an anniversary or birthdate, personal words between family or even the family crest. They are a creative way to display your love. For kids heading back to school, a custom pencil case is the perfect “first day” gift. Keep pencils and pens organized and reduce the number of pencil replacements you’ll need to purchase each year! If your family has always wanted to compile a family history, a journal jar may be the place to start. Simply write a story on a small piece of paper and place it in the jar. Anyone can contribute. When you’ve filled the jar, transcribe into a document. This jar is the perfect place to put the stories that are passed on at dinners, during family parties and more. Houseplants are ideal gifts for all occasions. Choose your favorite life advice to engrave on this adorable flower pot and make someone’s day, every day. Head back to school in style with these personalized backpacks. Each pack is adjustable with padded straps for comfort. If you’re on the hunt for unusual manly gifts, these DIY comic book coasters are ideal. Use materials from the hardware store (or those found in the garage), add some Mod Podge and comics, and you’ll have the perfect coaster for the man cave. Pro Tip: Don’t use comics from your man’s collector’s editions! What do you get for the woman who has everything? Leather earrings are a great place to start. Use your creative genius to design a custom piece of jewelry for your mom or sister. It’s a gift they’ll remember forever. Tip: Use faux leather for the vegan in the family. Remind your spouse why they go to work every day with a custom desktop plaque. The built-in easel makes displaying your favorite family photos simple to do. 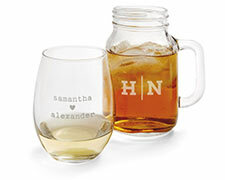 Make a statement with these glass-etched mason jars that can be customized for any family event. Now it’s simple to keep parties organized and dorm rooms personalized. Transform your living area with a handmade, easily washable rug. These rugs are perfect for high-traffic areas and simple to make. Do you have a chef in the family? This DIY Cookbook Stand is a gift they will appreciate all year long. Use reclaimed wood for a farmhouse feel or choose newer wood for a modern design. It’s the ideal way to show your love for the cook that’s been feeding you all year. Painted Porcelain Jars are ideal gifts for any family member. It’s perfect for storing curling irons and hair dryers, keeping kitchen items easily accessible and much more. Help your family turn lemons into lemonade — or at the very least, preserved lemons. This is a unique way to say thank you to a family member! It’s especially ideal for Moroccan and Middle Eastern families, as many favored recipes call for preserved lemons. What to get a dog who has everything? Save money by repurposing an old pallet into a dog or cat bed. By adding a pillow, you’ll create a durable gift for your pet that will last for years. Customize it with your pet’s name or a clever nickname. There is no member of your family that won’t appreciate a velvety-soft, crocheted blanket. This simple pattern makes it easy and it won’t be long before you see family sharing its warmth. These little zippered pouches are the ideal gift for a person who who needs to carry everything from cell phones to documents. Made from leather — or faux leather, if you prefer — and wool, they are very durable, but most importantly, it’s an accessory that makes everyone look good! Show off your family heritage with this Scottish Tartan trapping you can make at home. This is a great way to incorporate your Scottish family tartan pattern as you watch the Outlander series together. Show some love to your family bookworm with a custom book lamp. These are fully customizable gifts that you can make from old books. Choose a few pages from their favorite author! Design a reversible linen throw that will not only give family members something to cuddle with in summer, but huddle beneath to stay warm in winter. Keep comfort in mind when gifting to show you really care. Dogs are family too! Remind your four-legged friend that they mean the world to you by making them gourmet gift treats. You can really show them how much you care. Make this adorable dog collar from an old shirt! Pet bow tie collars are usually expensive but you can easily make your own. It’s the perfect holiday gift for your pet! Cinnamon Honey Butter is the gift that keeps on giving. The whole family will enjoy this thoughtful gift and best of all, it’s appropriate for any occasion. Plus, they’ll love that you made something from scratch. There’s nothing we like better than a way to display all of those photos from a recent gift-giving extravaganza. This simple photo display will hold as many pictures as you want. It’s the perfect gift to give a family member! Turn washi tape and paper clips into adorable decor for your journal. This customized gift is perfect for anyone who loves to journal, scrapbook or get creative with family. Be creative with themes, concepts, writing prompts and internal pages as you put together the ideal journal for the year. When every family member has sets of keys lying around the house, it’s easy to grab the wrong set. This year, give each member of your family a personalized key fob. Everyone will have a unique and personalized keyring so nobody gets confused. There’s no better git for your significant other than a handmade brown sugar scrub. Sugar is a natural humectant that helps gently exfoliate while preserving moisture in skin — keeping it super soft all day long. While we never need an excuse for celebrating family, thank you gifts are often overlooked. Remember to show your appreciation to that family member who has always been there for you — they’ll appreciate it more than words can say!